Chittagong Vikings are expected to bag their 4th win from five matches in this season handing the 6th loss to the Khulna Titans. The happiness of registering their first win didn’t last long for the Khulna Titans who lost to the Comilla Victorians on Friday. They opened their account with a 25-run win against the Rajshahi Kings on Wednesday. Against the Victorians, the Mahmudullah-led side made 181 batting first. The way they began, the 200-run mark looked easy to be breached. However, the last four overs didn’t go in their way as they finished at least 20 runs short. Comilla had a century opening stand but the Khulna Titans fought till the end only to lose in the final over. They will now be up against the Chittagong Vikings who have three wins from four matches they played. The earlier game between Vikings and Titans ended in a Tie with the Chittagong team winning in Super Over. 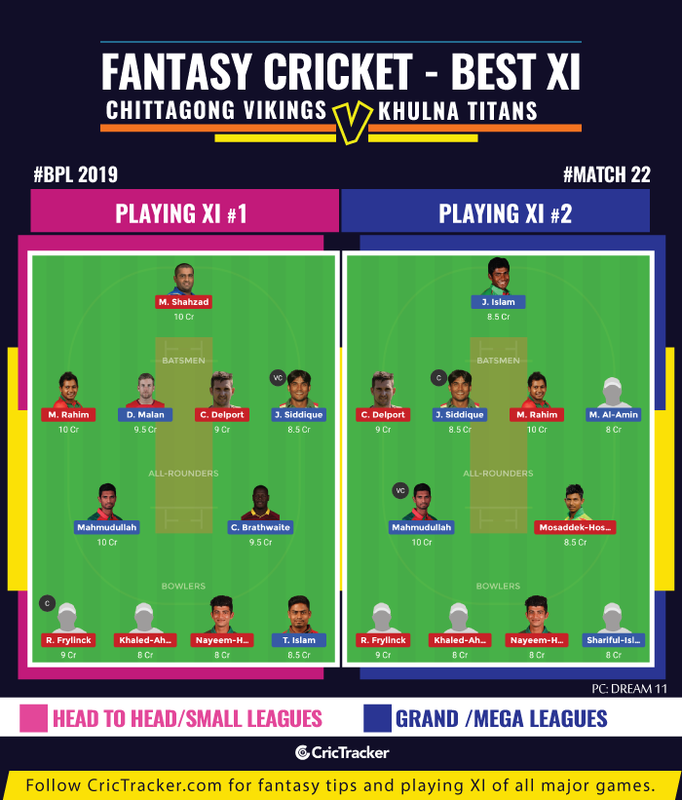 The 22nd match of the Bangladesh Premier League (BPL) 2019 will be played between Chittagong Vikings and Khulna Titans at the Sylhet International Cricket Stadium. The match starts at 6:30 PM local time (12:30 PM GMT) (6:00 PM IST). This game will be telecasted live on D Sport in India. Except for the game between Sixers and Victorians, the night games at the Sylhet have been high scoring ones. The last two night matches here witnessed 180+ scores. Mahmudullah (C), Ariful Haque, Nazmul Hossain Shanto, Carlos Brathwaite, Dawid Malan, Jahurul Islam, Shariful Islam, Taijul Islam, Al-Amin, Zahir Khan, Sherfane Rutherford, Subashis Roy, Junaid Siddique, Mahidul Islam Ankon, Tanvir Islam, Lasith Malinga, Yasir Shah, Brendan Taylor, Paul Stirling, Junaid Khan. Mushfiqur Rahim (C), Sunzamul Islam, Mohammad Shahzad, Mosaddek Hossain, Abu Jayed, Khaled Ahmed, Nayeem Hasan, Mohammad Ashraful, Robiul Haque, Yasir Ali, Nihaduzzaman, Shadman Islam, Sikandar Raza, Luke Ronchi, Robbie Frylinck, Cameron Delport, Dasun Shanaka, Najibullah Zadran. Yasir Shah joined the Khulna Titans having completed his tour of South Africa for Pakistan. Mohammad Shahzad could well turn out to be a brilliant option for the Chittagong Vikings at the top. The Afghanistan player utilizes the field restrictions to excel in the T20 format. The Vikings, who will be playing their first and last game at the Sylhet, could find easy with the bat in the friendly conditions. It won’t be a surprise if Shahzad turns out to be his team’s best batsman in this game. Robbie Frylinck will be a perfect choice for multiplier roles. The South African’s consistency is worth at least as vice-captain. Junaid Siddique has been consistent at the top for the Khulna Titans and could be picked as captain or vice-captain. 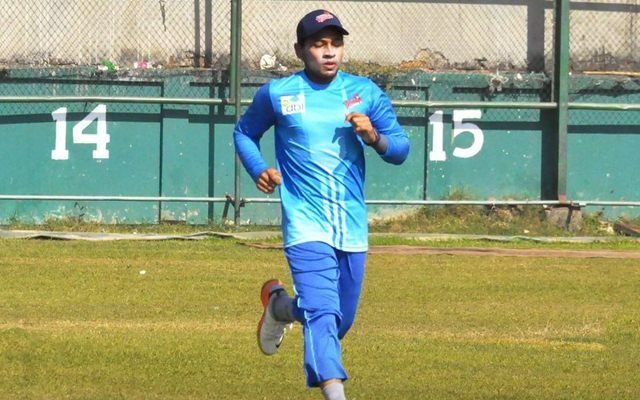 Given the way Khulna Titans has been consistent at changing their overseas options, it will be ideal to ignore the overseas players in their side.